Auchtoon! » That’s What Christmas Is All About, Charlie Brown. As the story goes, a producer had sold a Christmas special to the Coca-Cola company without actually having the Christmas special. So the producer, Lee Mendelson, called his friend Charles Schultz and said, “Good news. We’re going to create a Christmas special in less than 6 months.” Luckily they had an experienced animator, Bill Melendez, and Charles Schultz was a genius. Starting from scratch and against all odds they put together a quirky, introspective, sometimes dark cartoon with real children’s voices and jazz music and no laugh track and (at Schultz’s insistence) a bible verse. When it was complete and screened for executives, they knew it was going to be …a horrible flop. But it was too late. It was already scheduled in the TV Guide, so it had to run. As it turned out, people absolutely loved it and have every Christmas season since 1966. It is wonderful from start to finish. And every year of my childhood when it aired I strained to remember each frame, each note, each Dolly Madison commercial in between. 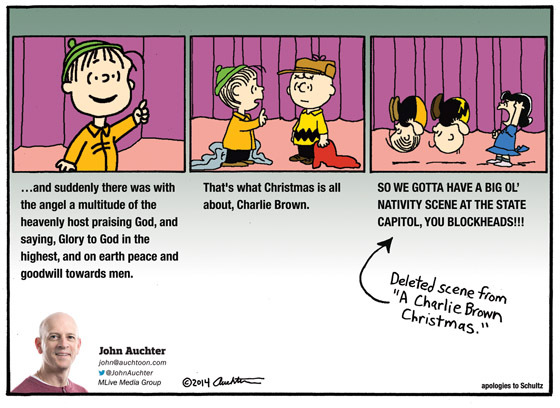 But the lynchpin to the whole show is Linus saying “Lights please” and then reciting Luke, chapter 2, verses 8 to 14. “8And there were in the same country shepherds abiding in the field, keeping watch over their flock by night. 10And the angel said unto them, Fear not; for, behold, I bring you tidings of great joy, which shall be to all people. 11For unto you is born this day in the city of David a Savior, which is Christ the Lord. 12And this shall be a sign unto you: Ye shall find the babe wrapped in swaddling clothes, lying in a manger. It is quite literally what Christmas is all about. That’s what Linus tells Charlie Brown. And in that context the show moves on to play out an example of joy of redemption. Perfect.